Climbing and access information for this peak is found on page 339. Livingston Douglas has provided an expanded and update route description for this peak which is set out below. The second highest of four Idaho peaks named Baldy Mountain, this peak is the prominent peak rising up behind Swan Valley, Idaho. It is one of 100 summits with greater than two thousand feet of prominence. Baldy Mountain in the Snake River Range in January of 2015. Larry Prescott Photo. Palisades Creek CG [(A)(3)(a.1)] as revised and updated. Palisades Creek Road/FSR-255 is located on the east side of Highway 26. The turnoff is signed and is approximately 7 miles south of Swan Valley and is exactly 6.4 miles north of Little Elk Creek Road. Drive up Palisades Creek Road for 2.1 miles to the Palisades Creek Campground. Palisades Creek Road is an excellent gravel road. Park outside the campground in the “trailhead overflow” parking spaces on the left/north side of the road. Do NOT cross the bridge to enter the campground and park there; the campground manager rigorously enforces the rules and no hiker parking is allowed in the campground. That being said, Palisades Creek Campground is a lovely little campground and the manager does a superb job of maintaining this campground. Please be aware that Palisades Creek Trail is a very popular trail and obtaining parking could be problematic on busy summer weekends. This climb begins on Palisades Creek Road, just below the bridge crossing for the Palisades Creek Campground. The elevation here is 5,540 feet. Please be aware that the campground area is barely inside the FS boundary, so do not wander down the road to access the South Ridge from a gentler angle. There is a cattle fence on the lower part of the South Ridge to block access to the private property that exists there. And there are several large homes located at the base of the southwest face of Baldy Mountain with property lines that extend up onto the lower part of the southwest face. Please consult the USGS Thompson Peak quadrangle to visualize the FS boundary here. 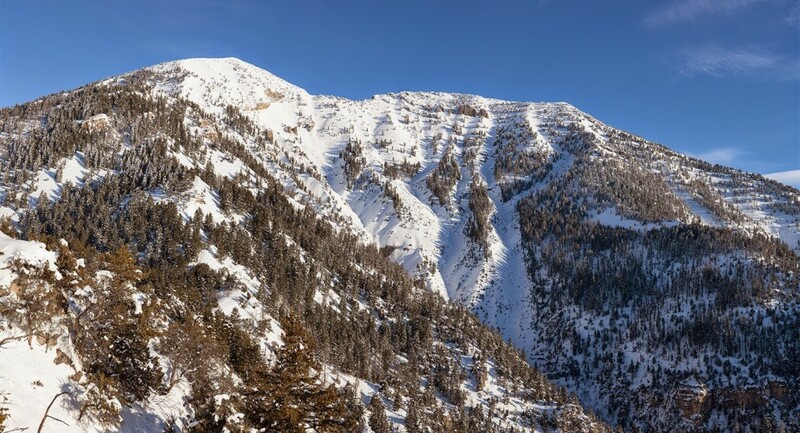 To avoid private property issues, climb northwest up a very steep hillside to access the South Ridge of Baldy Mountain. You will fight with loose gravel, brush and fallen leaves in this endeavor. But after about 300 feet of uphill, you will be standing in open, sagebrush terrain on the South Ridge. Grind your way northward on the rounded, somewhat ill-defined ridge. You will reach the forest at about 6,600 feet. Continue the moderately-steep scramble up the ridge through open forest, picking up remnants of an on-and-off game trail to help you make upward progress. Unfortunately, the forest thickens and includes boulders and cliff bands at some points. You will contend with low-growth pines, blowdown, and curlleaf mountain mahogany which loves to tear at your exposed skin. 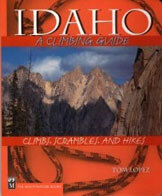 In addition, you must climb up over Point 7523 and descend 150 feet on a narrow ridge to a small saddle. 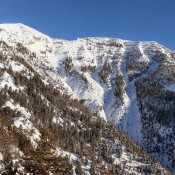 Above this saddle, continue climbing up to the narrow ridge section that is called Little Baldy Mountain (8,462 feet). Little Baldy isn’t very impressive and isn’t a lot of fun to wrestle across (loose gravel/scree and thick, low-growth pines). Once past Little Baldy, continue northward up a better-defined ridge that eventually gives way to open rock terrain and the end of the contentious forest. On the way to tree line, you must circumvent the right-hand side of a prominent cliff band hidden in the forest. Skirt this steep cliff band by side-hilling on a mix of steep, loose gravel and tundra. Once at tree line, your “forest issues” are over, but your loose scree issues have just begun. You still have about 500’ of uphill to go. The terrain is almost pure scree to the top from here and it’s intolerably loose. It’s difficult to navigate this section of the ridge both on the ascent and on the descent. But your perseverance pays off when you stand on top of this gentle giant. The summit has a large cairn with a post in it as well as a USGS Benchmark in a ground boulder. The views of the Palisades Reservoir, the Snake River, and other mountains south of here (e.g., Mount Baird) are truly splendid. The ascent takes about 2-1/2 hours and the descent takes less than 1-1/2 hours. If you’ve been doing your cardio training, you will enjoy this lung-busting climb. It requires a total of 4,700 feet in elevation gain (including additional ups and downs on the ridge) and a 6.5-mile roundtrip distance. The climb is not as easy as advertised and does require careful navigation on the descent to avoid an accidental descent down one of the many subsidiary ridges that feed into the primary South Ridge.